Lillian Randolph (December 14, 1898 – September 12, 1980) was an American actress and singer, a veteran of radio, film, and television. She worked in entertainment from the 1930s until shortly before her death. She appeared in hundreds of radio shows, motion pictures, short subjects, and television shows. Randolph is most recognized for appearing in It's a Wonderful Life (1946), Magic (1978) and The Onion Field (1979), the last of which was her final onscreen project. She prominently contributed her voice to the character Mammy Two Shoes in the Tom and Jerry cartoons between 1940 and 1952. Born Castello Randolph in Knoxville, Tennessee, she was the younger sister of actress Amanda Randolph. [b] The daughter of a Methodist minister and a teacher, she began her professional career singing on local radio in Cleveland and Detroit. At Detroit's WXYZ, she was noticed by George W. Trendle, station owner and developer of The Lone Ranger. He got her into radio training courses which paid off in roles for local radio shows. Randolph was tutored by a caucasian actor for three months on "racial dialect" before getting any radio roles. She moved on to Los Angeles in 1936 to work on Al Jolson's radio show, on Big Town, on the Al Pearce show, and to sing at the Club Alabam there. Lillian and her sister Amanda were continually looking for roles to make ends meet. In 1938, she opened her home to Lena Horne, who was in California for her first movie role in The Duke Is Tops (1938); the film was so tightly budgeted, there was no money for a hotel for Horne. Randolph opened her home during World War II with weekly dinners and entertainment for service people in the Los Angeles area through American Women's Voluntary Services (AWVS). Randolph is best known as the maid Birdie Lee Coggins from The Great Gildersleeve radio comedy and subsequent films, and as Madame Queen on the Amos 'n' Andy radio show and television show from 1937-53. She was cast in the "Gildersleeve" job on the basis of her wonderful laugh. Upon hearing the Gildersleeve program was beginning, Randolph made a dash to NBC. She tore down the halls; when she opened the door for the program, she fell on her face. Randolph was not hurt and she laughed—this got her the job. She also portrayed Birdie in the television version of The Great Gildersleeve. In 1955, Lillian was asked to perform the Gospel song, "Were You There" on the television version of the Gildersleeve show. The positive response from viewers resulted in a Gospel album by Randolph on Dootone Records. She found the time for the role of Mrs. Watson on The Baby Snooks Show and Daisy on The Billie Burke Show. Her best known film roles were those of Annie in It's a Wonderful Life (1946) and Bessie in The Bachelor and the Bobby-Soxer (1947). The West Adams district of Los Angeles was once home to lawyers and tycoons, but during the 1930s, many residents were either forced to sell their homes or take in boarders because of the economic times. The bulk of the residents who were earlier members of the entertainment community had already moved to places like Beverly Hills and Hollywood. In the 1940s, members of the African-American entertainment community discovered the charms of the district and began purchasing homes there, giving the area the nickname "Sugar Hill". Hattie McDaniel was one of the first African-American residents. In an attempt to discourage African-Americans from making their homes in the area, some residents resorted to adding covenants to the contracts when their homes were sold, either restricting African-Americans from purchasing them or prohibiting them from occupying the houses after purchase. Lillian and her husband, boxer Jack Chase, were victims of this type of discrimination. In 1946, the couple purchased a home on West Adams Boulevard with a restrictive covenant that barred them from moving into it. The US Supreme Court declared the practice unconstitutional in 1948. 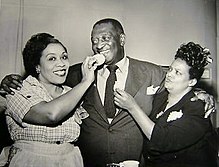 From left: Lillian Randolph (Beulah), Ernest Whitman (Bill), and Ruby Dandridge (Oriole): Beulah 1952-53. Like her sister, Amanda, Lillian was also one of the actresses to play the part of Beulah on radio. Randolph assumed the role in 1952 when Hattie McDaniel became ill; that same year, she received an "Angel" award from the Caballeros, an African-American businessmen's association, for her work in radio and television for 1951. She played Beulah until 1953, when Amanda took over for her. In 1954, Randolph had her own daily radio show in Hollywood, where those involved in acting were featured. In the same year, she became the first African-American on the Board of Directors for the Hollywood chapter of the American Federation of Television and Radio Artists (AFTRA). Lillian was selected to play Bill Cosby's character's mother in his 1969 television series, The Bill Cosby Show. She later appeared in several featured roles on Sanford and Son and The Jeffersons in the 1970s. She also taught acting. In William Hanna and Joseph Barbera's Tom and Jerry cartoons during the 1940s and early 1950s, she was uncredited for voicing the maid character, Mammy Two Shoes. She voiced Jerry Mouse in The Milky Waif (1946, uncensored version), in the scene where Jerry and Nibbles hide in the closet and disguise themselves as a pair of black people. The character's last appearance in the cartoons was in Push-Button Kitty in September 1952. Hanna-Barbera and Randolph had been under fire from the NAACP who called the role a stereotype. Activists had been complaining about the maid character since 1949. The character was written out entirely. Many of these had a white actress (June Foray) redubbing the character in American TV broadcasts and in the DVD collections. This was not the only time Randolph received criticism. In 1946, Ebony published a story critical of her role of Birdie on The Great Gildersleeve radio show. Randolph and a scriptwriter provided a rebuttal to them in the magazine. Lillian Randolph believed these roles were not harmful to the image or opportunities of African-Americans. Her reasoning was that the roles themselves would not be discontinued, but the ethnicity of those in them would change. In 1956, Randolph and her choir, along with fellow Amos 'n' Andy television show cast members Tim Moore, Alvin Childress and Spencer Williams set off on a tour of the US as "The TV Stars of Amos 'n' Andy". However, CBS claimed it was an infringement of its rights to the show and its characters. The tour soon came to an end. By 1958, Lillian, who started out as a blues singer, returned to music with a night club act. Randolph made a guest appearance on a 1972 episode of the sitcom Sanford and Son, entitled "Here Comes the Bride, There Goes the Bride" as Aunt Hazel, an in-law of the Fred Sanford (Redd Foxx) character who humorously gets a cake thrown in her face, after which Fred replies "Hazel, you never looked sweeter!". Her Amos 'n' Andy co-star, Alvin Childress, also had a role in this episode. She had a role in the television miniseries, Roots (1977) and also appeared in Magic (1978) and The Onion Field (1979). In March 1980, she was inducted into the Black Filmmakers Hall of Fame. Lillian's daughter, Barbara, grew up watching her mother perform. At age eight, Barbara had already made her debut in Bright Road (1953) with Harry Belafonte and Dorothy Dandridge. Choosing to adopt her mother's maiden name, Barbara Randolph appeared in her mother's nightclub acts (including that with Steve Gibson and the Red Caps) and had a role in Guess Who's Coming to Dinner (1967). She decided to follow a singing career. Randolph died of cancer in Los Angeles, California on September 12, 1980 at the age of 81. She was buried in Forest Lawn Memorial Park (Hollywood Hills). For unknown reasons her gravestone states she was born in 1914. Her sister, Amanda, is buried beside her. ^ Mullins, Ray (9 October 2016). "Finding James (my search for Uncle Remus)". wordpress.com. Retrieved 29 May 2017. ^ Springs, Toledo. "Chasing Jack Chase: Part 5-Fade to Black". thesweetscience.com. Archived from the original on 3 September 2010. Retrieved 17 October 2010. ^ a b Radio Actress Lillian Randolph Seeks Divorce. Jet. March 5, 1953. Retrieved October 17, 2010. ^ Actress Lillian Randolph Divorces Mate. Jet. 17 December 1953. Retrieved 17 October 2010. ^ Ellenberger, Alan R. (2001). Celebrities in Los Angeles Cemeteries: A Directory. McFarland. pp. 95–96. ISBN 978-0-7864-0983-9. ^ a b Black Film Hall of Fame Inducts 7. Jet. March 20, 1980. Retrieved October 10, 2010. ^ a b c d "Lillian Randolph". BlackPast.org. Retrieved October 19, 2010. ^ a b Wilson, Scott (2016). Resting Places: The Burial Sites of More Than 14,000 Famous Persons, 3d ed. (2 volume set). McFarland. p. 613. ISBN 978-1-4766-2599-7. Retrieved January 25, 2017. ^ "The Five Red Caps". Singers.com. Retrieved October 10, 2010. ^ New York Beat. Jet. December 31, 1953. Retrieved October 10, 2010. ^ a b c d e Witbeck, Charles (September 1, 1969). "Madame Queen Joins Cosby". The Evening Independent. Retrieved October 19, 2010. ^ Rea, E. B. (January 10, 1948). "Does Radio Give Our Performers a Square Deal?". The Afro American. Retrieved 17 October 2010. ^ a b "Lillian Randolph". Internet Movie Database. Retrieved October 17, 2010. ^ Barlow, William, ed. (1998). Voice over: the making of Black radio. Temple University Press. p. 334. ISBN 1-56639-667-0. 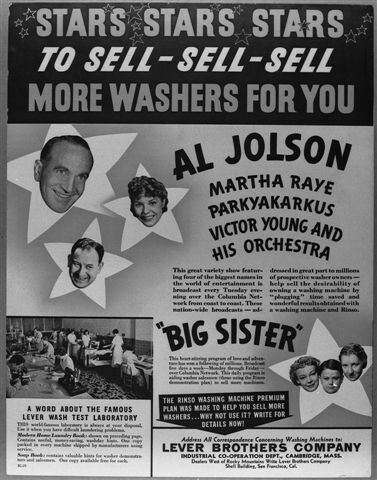 ^ "Copy of promotional material for Al Jolson's radio show". museumoffamilyhistory.com. Retrieved October 22, 2010. ^ Jovien, Harold (April 2, 1940). "Via Your Dial". The Afro American. Retrieved January 16, 2011. ^ "Club Alabam". Eighth & Wall. Retrieved 27 December 2010. ^ Steinhauser, Si (May 24, 1942). "Girls Can't Qualify For Announcing Jobs, Says Network Leader". The Pittsburgh Press. Retrieved November 13, 2010. ^ "Network and Local Radio Listings". The Sunday Sun. January 4, 1942. Retrieved January 16, 2011. ^ Rea, E.B. (March 16, 1943). "Encores and Echoes". Baltimore Afro-American. Retrieved March 17, 2011. ^ a b Fanning, Will (April 23, 1958). "A Color Peacock To Shore Show; Notes". Pittsburgh Post-Gazette. Retrieved 13 November 2010. ^ BCL (1 October 1945). "Riding the Airwaves". Milwaukee Journal. ^ Shaffer, Rosalind (December 23, 1945). "Canny Judgment Boosted 'The Great Gildersleeve'". St. Petersburg Times. Retrieved October 17, 2010. ^ Forecast. Jet. April 29, 1954. Retrieved October 10, 2010. ^ "Theatrical Whirl". The Afro American. 3 March 1956. Retrieved 17 October 2010. ^ "Theatrical Whirl". The Afro American. April 7, 1956. Retrieved October 17, 2010. ^ "Newcomers With Snooks". The Milwaukee Journal. 15 September 1946. ^ Dunning, John, ed. (1998). On the Air: The Encyclopedia of Old-Time Radio. Oxford University Press, USA. p. 840. ISBN 0-19-507678-8. Retrieved June 10, 2010. ^ "Lillian Randolph, a film and television jewel". African-American Registry. Retrieved September 27, 2010. ^ McCann, Bob, ed. (2009). Encyclopedia of African American Actresses in Film and Television. McFarland. p. 461. ISBN 0-7864-3790-1. Retrieved October 19, 2010. ^ a b "West Adams History". westadamsheightssugarhill.com. Retrieved October 17, 2010. ^ "Lillian Randolph and husband Jack Chase". Los Angeles Public Library. Retrieved July 30, 2011. ^ "Actress Fights Home Covenants". Baltimore Afro-American. September 14, 1946. Retrieved October 17, 2010. ^ "Lillian Randolph". Baltimore Afro-American. May 17, 1952. Retrieved January 16, 2011. ^ Lillian Randolph Sets Busy Pace On Radio. Jet. April 10, 1952. Retrieved October 10, 2010. ^ People. Jet. October 28, 1954. Retrieved October 10, 2010. ^ Entertainment. Jet. April 15, 1954. Retrieved October 10, 2010. ^ Kisner, Ronald E., ed. (April 6, 1978). Marla Gibbs: TV Maid for The Jeffersons. Jet. Retrieved October 10, 2010. ^ Lehman, Christopher P., ed. (2009). The Colored Cartoon. University of Massachusetts Press. p. 152. ISBN 1-55849-779-X. Retrieved October 10, 2010. ^ MacDonald, J. Fred. "Don't Touch That Dial! : radio programming in American life, 1920-1960". jfredmacdonald.com. Retrieved October 20, 2010. ^ Clayton, Edward T. (October 1961). The Tragedy of Amos 'n' Andy. Ebony. Retrieved September 27, 2010. ^ New York Beat. Jet. May 1, 1958. Retrieved October 10, 2010. ^ "Sarasota Herald-Tribune TV Week". Sarsota Herald-Tribune. May 5, 1972. Retrieved October 22, 2010. ^ Television. Jet. January 27, 1972. Retrieved 10 October 2010. ^ "Alvin Childress on Sanford and Son". Washington Afro-American. May 25, 1976. Retrieved October 16, 2010. ^ Lucas, Bob, ed. (January 27, 1977). Roots Of Blacks Shown In Eight Days Of TV Drama. Jet. Retrieved October 10, 2010. ^ "Deaths Elsewhere". Toledo Blade. September 15, 1980. Retrieved September 20, 2010. ^ Like Mother, Like Daughter. Jet. September 25, 1952. Retrieved October 10, 2010. ^ Robinson, Louie, ed. (May 23, 1968). Film Boost For Star's Daughter. Jet. Retrieved October 10, 2010. ^ "Lillian and Barbara Randolph at Allen's Tin Pan Alley". The Spokesman-Review. July 29, 1958. Retrieved October 22, 2010. ^ Barbara Randolph Seeks Record Stardom. Jet. December 29, 1960. Retrieved October 10, 2010. ^ "Barbara Randolph". Internet Movie Database. Retrieved October 10, 2010. ^ Goldberg, Marv. "Marv Goldberg's R & B Notebook-Back to the Red Caps". Goldberg, Marv. Retrieved February 4, 2011. ^ "People and Places". Star-News. September 16, 1980. Retrieved September 20, 2010. ^ Census. Jet. October 9, 1980. Retrieved October 10, 2010. Wikimedia Commons has media related to Lillian Randolph. The Great Gildersleeve TV Episode at Internet Archive. The Beulah Show at Internet Archive-1953. The Great Gildersleeve Radio Episodes at Internet Archive. This page was last edited on 27 March 2019, at 15:04 (UTC).